In the next few blog entries, I’m going to be focusing on green technologies. I know it is stretch but could not resist kicking off the series by writing about “nature’s engineer”. Our home in Western Massachusetts is surrounded by hundreds of acres of woods and there’s lots of wildlife around including deer, fox, wild turkey, coyotes, black bear and beavers. 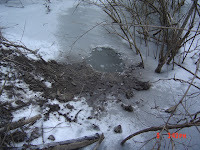 We try and get out in the woods as much as possible and especially look forward to the winter because the ponds, brooks and swampy areas freeze over, allowing us to walk on the ice and explore places we cannot get to when it is warmer. It’s been cold recently and there is a good 4 inches of ice – more than enough to support the weight of an adult. We were part icularly interested in checking out a beaver pond that we discovered about a year and a half ago. 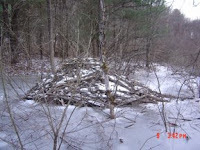 The beavers have built a prett y good size dam and lodge and it’s always fun to walk over the ice, getting a close-up look at their work. Yesterday my daughter and I got right up next to the lodge and got some great pictures. The first picture here is of the lodge and the second is a picture of a hole next to the lodge that they use (it’s thinly frozen over) to get in and out of the water through the ice. The lodge entry is under water so this is also their way in out out of their home. In the second picture you can also see mud they’ve recently dragged up off the bottom to patch and seal the lodge. Here’s a couple of pictures of trees they’ve cut. The first is the stump of a tree they dropped across our road in August. 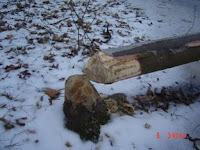 The second is the stump of a tree they cut within the last week. In September we first noticed what looked like a cable-splice pedestal box but c ould not get close to it because it was on a little island in the middle of the flooded area. Yesterday, the ice allowed us to walk to the box and finally get a close up look - here’s a picture. You can see the box is bent and twisted with the cover broken off. 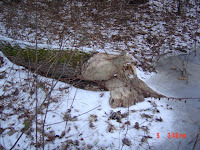 I’m guessing the combination of high water and ice last winter twisted and broke the pedestal open – I don’t think the beavers busted it open. 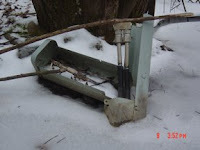 I also don’t believe this cable is active – about 10 years ago Comcast installed a piece of fiber that feeds the coaxial connections to the homes on our road. It’s still interesting to see the kind of damage beaver can cause - I just hope they don’t know where the fiber splices are!